The Carl Martin Boost Kick is a 9V-battery-powered pedal designed to provide up to 12dB of boost to give that extra "kick" required for a great solo. This allows a virtually unlimited range of solo sounds without compromising sonic quality. Getting your solos to cut through the cacophony of the band can be a handful. With up to 12dB boost and the 3 band EQ at your feet, hitting the right sound at the right level is a breeze. 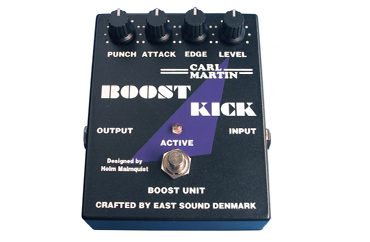 The Carl Martin Boost Kick is true bypass and features an AC adapter jack.